The popular Wegmans grocery chain is cutting health benefits for its part-time employees and plans to send them instead to the ObamaCare exchanges where they may get more generous benefits and subsidies than the company offers. Several Wegmans employees confirmed part-time health benefits had been cut and said the company said the decision was related to changes brought about by the Affordable Care Act, according to a report in The Buffalo News. Wegmans is one of thousands of employers likely to make the same decision. A young family of four that is barely scraping by on $35,000 a year would be at the lower end of the income level of those eligible for subsidies for private health insurance and therefore would receive a relatively large subsidy — $10,742 a year, according to ObamaCare calculators. That would be subtracted from the estimated cost of their $12,130 policy, resulting in $1,388-a-year premiums. Wegmans did not reveal how much its employees pay for their health benefits now, but their calculations show the premiums they would pay in the exchanges would likely be lower. American Action Forum president Douglas Holtz-Eakin told a Capitol Hill forum on Monday that Obama administration officials have just created “one of the broadest and deepest advertising networks” they could have imagined to spur enrollment in the ObamaCare exchanges. Employers have unmatched communication channels to explain to their employees why it is advantageous for them to get taxpayer-subsidized coverage from the exchanges instead of through their employers. “There is an unambiguous incentive now for employers to stop providing health insurance, prepare to pay the penalty, and send their employees to the exchanges instead where they can get much-more-heavily subsidized coverage,” Holtz-Eakin said. Holtz-Eakin called the administration’s move “deviously brilliant” to simultaneously postpone the employer mandate and also to allow enrollment in the exchanges without verification of income and qualification for employer coverage. Brian Murphy, a partner at Lawley Benefits Group, an insurance brokerage firm in Buffalo, said part-time employees may benefit from Wegmans’ decision, according to The Buffalo News. “If you have an employee that qualifies for subsidized coverage, they might be better off going with that than a limited part-time benefit,” Murphy said. Under the Affordable Care Act, part-time employees are not eligible for health insurance subsidies if their employer offers insurance. “It’s a win-win. The employee gets subsidized coverage, and the employer gets to lower costs,” Murphy said. The only ones who are harmed, of course, are taxpayers who will be paying hundreds of billions of dollars more to provide health insurance coverage for people who previously were getting it through their employers. Enrollment will also be boosted by the administration’s decision to delay income verification for a year and rely instead on an honor system, relying on applicants to accurately report their income in applying for ObamaCare subsidies. Income verification is one of the most complex parts of ObamaCare implementation that requires cross-checking information on each application with seven different government agencies. In the rules announcing the delay, the administration acknowledged the difficulty of getting verification systems up and running, saying “large amount of systems development on both the federal and state side…cannot occur in time for October 1, 2013.” Therefore, income verification “is not feasible for implementation for the first year of operations.” The administration will, instead, rely on an honor system for reporting. Diana Furchtgott-Roth of the Manhattan Institute said that the price tag for ObamaCare will soar as a result of last week’s announcements. “The program will cost much more because there is no income verification required for people to qualify for subsidies in the exchanges, so some might understate their income and get more subsidies,” she said. “The whole ObamaCare system requires a vast array of documentation from employers and individuals, all checked by government bureaucrats, making the law extraordinarily difficult to enforce. That’s why HHS officials have to keep changing the rules as they go along,” Furchtgott-Roth said. The two economists agreed that the budgetary consequences are enormous as millions more people than originally estimated will lose employment-based coverage and move instead into coverage subsidized by taxpayers in the exchanges. The Obama administration has been scrambling to raise funds to pay navigators – workers who will enroll people in exchange coverage – and there has been a great deal of concern that older, sicker people would be more likely to enroll in the exchanges as younger, healthier “invincibles” forgo enrollment. Allowing people to enroll in subsidized coverage without income verification and giving employers an incentive to push their employees into the exchanges changes that dynamic. The decision to rely on an honor system for people to report their income is part of a larger pattern of adjusting the law to suit the administration’s political objectives. Holtz-Eakin pointed out that the administration had earlier announced it would not enforce the individual mandate penalties for people who would otherwise have been eligible for Medicaid coverage, but who live in states that decide not to expand the program. Posted on Forbes, July 14, 2013. 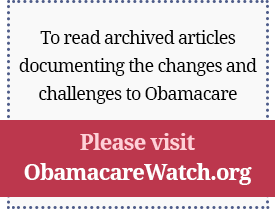 Previous Article: Did Employers Just Become Aggressive Obamacare Implementers? Next Article: Goodbye to Mandates!